We installed our first permanent connection to the Net, repatriating our web server from a local ISP, round about Easter time in 1997. At the time the best value available was still an eye-watering �7,200 per year, or approximately $11,500. We got it from Demon Internet who were pioneers of moderate prices for Net access. Part of the cost was always going to be hard to avoid because the circuit involved taking a 64Kb link to London, some 200 miles away. Over time Demon managed to keep reducing their costs but it was always frustrating to hear the kinds of prices that you could get in the States. In fact when our 64K started to fill, we managed to offload about 90% of the bandwidth with a bit of crafty analysis of where it was going (mostly images from some of the commercial web sites we hosted) and then renting space from Verio in Utah to serve it. We spent an extra $55 per month and got nearly all of our bandwidth back again. Because of the cost we were always ready to entertain people who called us up trying to sell us cheaper bandwidth, though few ever sounded plausible and the savings would have been marginal in any case. Then before Christmas 1999, we got a call from Tele 2 to say that they had a franchise in our area for `wireless leased lines' — data links delivered by radio. The prices and the bandwidth looked attractive, plus there was apparently a special introductory discount on the installation. We signed up, asking for a class C block of additional addresses to be allocated. Then it all went silent. It would be unfair to accuse Tele 2 of serious disorganisation, but it has taken a very long time to get anything installed and it's usually not been until we ring them that any information has been forthcoming. During the intervening period, their prices have dropped from good to extremely appealing. At the time of writing they are charging �199 for 256K (the lowest leased-line bandwidth they do, though there are other services listed). Apparently our bandwidth can be remotely increased up to 2Mb without any equipment changes. You can use it as an ISDN substitute starting at �35 per month - which for a permanently-on service with a fixed IP address sounds like a bargain. Their response to yet another follow-up call last week caused complete surprise — a promise that we would be a priority because of the delays so far and, yes, an installer would ring back. So we expected another month of silence, but to general astonishment a phone call followed with a promise to turn up and install the link the next morning at 9. To similar surprise, a cheery man with a van and an assistant did indeed turn up more or less on time. First off came the `site survey', i.e. stick an aerial on a pole and wave it around looking from signals from the base station. The geography here is not very favourable, with us half way down the side of a steep hill (Bradford is a very bad place to cycle around), but it turned out that we are just about line-of-sight to a hilltop across the valley where there is a TV repeater and one of Tele 2's access points. (The place in question is `Idle' and is famous as the home of The Idle Working Mens' Club). Despite the fact that we are shielded by trees our installer announced himself more than satisfied with a very strong signal and so the permanent pole and aerial were installed. The thing on top of the pole is probably about a foot square with what looks like a good chunk of the electronics in a block bolted on the back of it. A thin coaxial cable then comes down into the building. According to the installer the system uses a band at around 3.2GHz, so line-of-site is very important and anything much getting in the way is a problem. Since it's summer and the trees are in full leaf, we won't have to worry as we might have done if the system went in in winter and the tree effect couldn't have been predicted. The cable terminates in the building in something called a `speedbox' which takes the coax, a power lead from a laptop-like power supply and provides a standard twisted-pair Ethernet connector. The box is half the size of a typical 8-port Ethernet hub — it's tiny. Our installer plugged in his laptop, tested it to check that we were getting data and then left after telling us the IP address that we got initially (212.19.86.71) and that the default gateway should be 10.somethingorother. Business meetings intervened, so it was a couple of days later before the device could be put to work under Linux. it looks as if we will be happy. There are some pictures below of the antenna and the trees that it works through. Overall — relatively painless installation and it works. Being the only user on 256Kb is really nice! 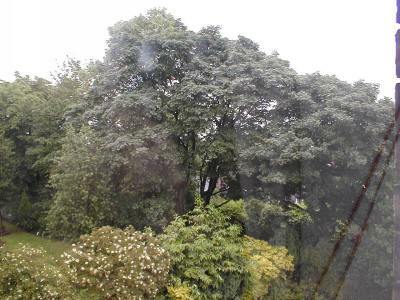 View of the trees (through a window, sorry about the reflections). There is just the one stand of trees and clear space can be seen beyond them — hence the low signal attentuation. 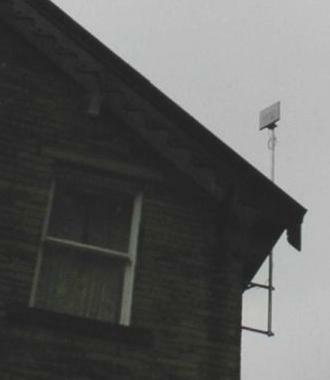 The aerial attached to the house. This is huge old Victorian house, so the scale of the window may mislead you. Well, there was bound to be a catch. Unfortunately you only discover after the event, but here are a few of our lessons. You get what you pay for. Our expensive leased line to Demon comes with 24x7 support; the Tele2 line with essentially none unless you can get through on their phone number. The hilarious bit is their fault-reporting form. It's on their website. Think about it — your line is down, but the ony way to report a fault is over the web. DOH! Tele2 have known for ages now that we want a class C block of addresses and delegated reverse DNS. End result: silence, apart from one apologetic phone call from a bloke who genuinely sounded saddened not to give us what we need, but then didn't do anything about it. Eventually we got a call back from their IP address administrator who sounded horrified that we had been promised a class C block by the salesman. Apparently they just don't have enough IP addresses themselves to start handing them out. And if we are given less than 256 addresses (a class C block), they can't delegate the reverse DNS to us (that used to be true, but I'm sure that later versions of named are able to handle blocks based on other than the default original bitmasks). We still have seen neither hide nor hair of any documentation about the service barring the rather sketchy stuff on their website — not much use to Linux users, but then we did figure it out for ourselves eventually. The service is fast — and it's cheap - and there is a bandwidth meter on the customer zone of their website that lets you see how much you are using. That's a neat touch. They don't have anything in place remotely like the bulk secondary DNS that Demon offers — with that, when we register a domain, we contact Demon's automated service and tell it that it is secondary DNS for that domain. A few hours later, it's all in place. Recent telephone calls have sharpened things up. The long silence after our last ineffectual conversation finally flushed out some embarrassment and we got called by the IP address admin and their Linux bod in fairly rapid order. Neither were able to do anything for us, but at least left us feeling that someone is finally taking notice. However, words are cheap, it's action that we want! Conclusions: not bad at the price, but unsuitable at present as a `leased line'. Better thought of as something else. We will still have to keep our Demon connection, but might move some of our less mission-critical outbound bandwidth onto the link.